Last year, when Samsung unveiled its Galaxy S8 and S8+ smartphones, it also announced a brand new wireless charging stand - larger and better looking than its predecessor. Called Samsung Wireless Charging Convertible Stand, the accessory was initially priced at $89, but it can now be bought for $59 - at least if you're getting it from Samsung, Best Buy, or Amazon. As its name suggests, the Samsung Wireless Charging Convertible Stand can be converted from a pad to a stand, thus allowing you to wirelessly charge your smartphone in multiple positions. The accessory is covered in a nice leather-like material (in either black, or tan), features an LED indicator light, and includes a cooling fan that kicks in when needed. The Samsung Wireless Charging Convertible Stand is compatible with all Qi-enabled smartphones, from Samsung's latest Galaxy flagships to Apple's iPhone X, iPhone 8, and iPhone 8 Plus. The stand can even fast-charge some handsets, but only Samsung-made models (Galaxy Note 5, Galaxy S6 edge+, and newer). 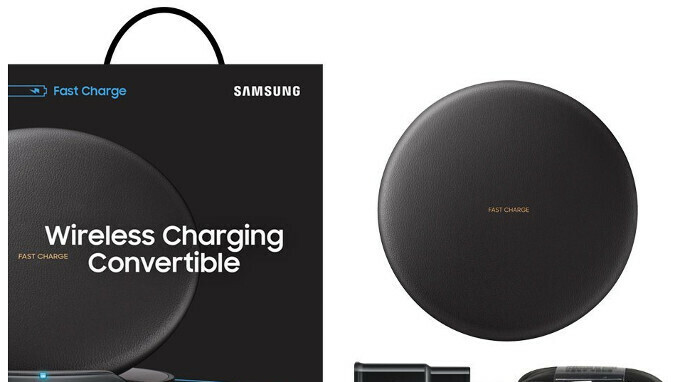 To save $30 on Samsung's Wireless Charging Convertible Stand right away, you can visit any of the three source links below. Nokia lumia 1520 wireless charging (first to introduced wireless charging) still can charge both iPhone and Samsung . The Lumia 920 had it in 2012. It was pretty freaking cool at the time. Lotta Samsung components in an iPhone. This thing doesn't work with a case on, even though they claim it does. I'm using an official Samsung rugged case for my Note 8, and it continually pauses. No wonder they gave it away as a free gift. works with iPhone as well! !, as it should since how much of the phone is made by other companies technology... apple would crumble if they didn't have US Sheeple or other companies sympathy and compassion to share their technology with them..